The Yokohama Smart Community was inaugurated in 2011, when companies and organizations which support the principle “In order to realize a truly rich and full community life, it is imperative to learn from nature” joined together to develop technology to effectively incorporate the use of natural energy into everyday life of Japanese residences. 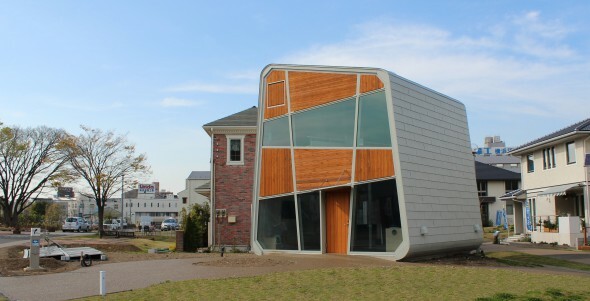 Smart Cell, a field demonstration and research house at the Yokohama Smart Community, is designed as a community model for the next smarter greener generation. Taking measures against community power failures and reducing the system’s load. Linking of energy and information between houses. Researching to create a compact community that is in a symbiotic relationship with nature, is self-sufficient, and recycling-based. Building a vision for the future that transcends individual industry sectors and industry types. A project that will last for “100 years”, continuing to evolve toward the future. The Smart Cell project is a community model that aims to foster the natural environment, as well as arts and culture that vitalize the residents, and to develop a recycling society with efficient energy use that is also conscious of food, healthcare, and the natural environment. Participants in the Yokohama Smart Community include supporting businesses and organizations (construction, energy, technical education). Each participant brings unique experience to the development of new ideas to a site providing opportunities for verification and experiment in the creation of practical future communities. The project encompasses the building of a comprehensive town system integrating nature and the environment. Materials and technologies from BASF are helping to make the newly-completed demonstration project at Yokohama Smart Community more energy efficient. BASF’s high-fluidity concrete, Smart Dynamic Concrete, reduces construction period and enables high-durable and high quality of concrete construction regardless of the technical level and skills of construction workers. Neopor, BASF’s innovative insulation foam, reduces energy use for cooling houses in hot and humid climates and as such is effective for energy-efficient construction and Protectosil® CIT for surface protection of concrete with corrosion inhibitor, which helps to prolong the life of designed building construction. The use of BASF’s water-permeable pavement, Elastopave®, can enhance the energy efficiency in structures, leading to the alleviation of the urban heat island effect and the reduction in CO2 emissions. muRata is responsible for HEMS, Energy Optimization of the I & E Distributed Power system witch includes battery and PV inverter technology control. Aiming at a Higher Renewable Ratio with Peak shaving function by flexible inverter and battery management and Lower facilities for generation and distribution systems. The Network system assists Flexible generation required to address Wind and Solar intermittency. The ICT integrates I & E Higher energy efficiency through cloud-based intelligent management and optimization. Finally, Reserve Electric power is supplied at blackouts or brownouts.